A great business meeting app is an essential tool in a reunion. Meeting Notes Taker is a smart meeting recorder app specifically designed for business meetups, that allows you to record audio during business meetings and take handwritten notes (notepad sketching) while recording reunions. After the meeting, you will find a perfect meeting minute (meeting memorandum / business report) already in your smartphone. It has been designed to help business men, employees and freelances, and it is the best business tool for you and your co-workers. Are you looking for effective meetings or for a way to increase meetings productivity? With Meeting Notes you can take quick notes during any reunion and prepare meeting reports easily and quickly. 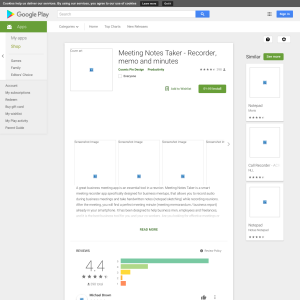 The best meeting recorder among business tools and minutes taking apps. - Record audio during business meetings or take minutes easily during reunions. Take a minute on your own or let the meeting recorder manage the note taking, while you keep the meeting agenda and increase productivity. - Master reports writing: write memos during meetings and transcribe audio for easy meetings minutes / business reports. Perfect for report writing and memo writing. - Share notes with your coworkers with this memo recording app. Write memo notes and send business emails attaching your recorded notes. It's the best meeting management tool you will ever find. - Organize notes like a pro: feel free to take fast notes during meetings, and let the app organize your notes. You will find everything right where you need it. Note-taking made perfect. You just need to press the "Start" button to start an high quality voice recording process. After you've heard anything interesting, just tap one of the three audio notes button: Meeting Notes Taker will retrieve the audio from the past and save it for you. Moreover, you can take any written notes during the audio registration. It's easier than it seems: you'll never miss any important note! Meeting Notes Taker is perfect for recording conversations in the workplace and during meeting and reunions. You can use it in board meetings, conferences, sales meetings, update meetings and during every group meeting. It is a meeting assistant, a report writing app, and even a boss recorder! Workplace bullying and mobbing are rising in the workplace and can involve verbal / psychological abuse and harassment in the office. Any employee may be facing a poisoned work environment as a result of ongoing verbal abuse or harassment. A bullied employee is not required to withstand this form of mistreatment, and could commence a constructive dismissal claim to receive his or her severance entitlements. In employment disputes, having recorded documentation can be very relevant in the context of constructive dismissal cases. That's why recording conversations in the office, especially with a hidden voice recorder, might be really useful against all bullies, bullying bosses as well as bully co-workers. Please beware of your country legal regulations regarding recording conversations without consent.